How the time flies! 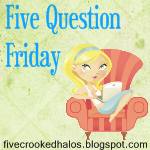 It's all ready another edition of Five Question Friday with Mama M! Check it out! I was not a boygroup kinda gal in my teens. I loved me some New Kids on the Block when I was in elementary school. (Jordan was my favorite!) But, by High School it was totally NOT my scene. My idea of a boygroup in my teens would have been The Grateful Dead or Crosby, Stills, Nash and Young. I still love me some NKOTB and Boyz II Men, though! If you know me, you know there is only one man in the world that I want to meet. I would do almost ANYTHING to meet him. His name would be Jimmy Buffett. *sigh* I LOVE HIM! We would hang out in the Keys, drink some great margaritas and swap stories. I would marry this man. I mean, it's ridiculous! I am brought to tears every time he takes the stage at his concerts. 4. Favorite thing to cook with (i.e. stainless, non-stick, Dutch oven, microwave, debit card... or, perhaps a cauldron, etc.)? I love to cook! I don't have something in particular I love to cook with though. I use the oven (duh!) and I also have some really nice Wolfgang Puck stainless steel cookware that Jason's parents got us for Christmas a few years ago. Right now it's the pregnancy jeans that I wear to work EVERYDAY. I am getting kind of sick of them! I still throw on my favorite GAP jeans on the weekends and hold them up with a Bella Band, but it's getting kinda tough! I grew up on Jimmy Buffet. My parents always listened to his music and went to his concerts. It definitely rubbed off...I'm definitely a parrot head.